With LabSolutions, both LC and GC systems are operated from the same software, enabling simultaneous control of multiple instruments from a single PC. The LC and GC instruments connected can be used in a flexible manner by switching between them. The shared LC and GC analysis operating environment, which inherits the operability of LCsolution and GCsolution, lessens the training time for workstation operations. 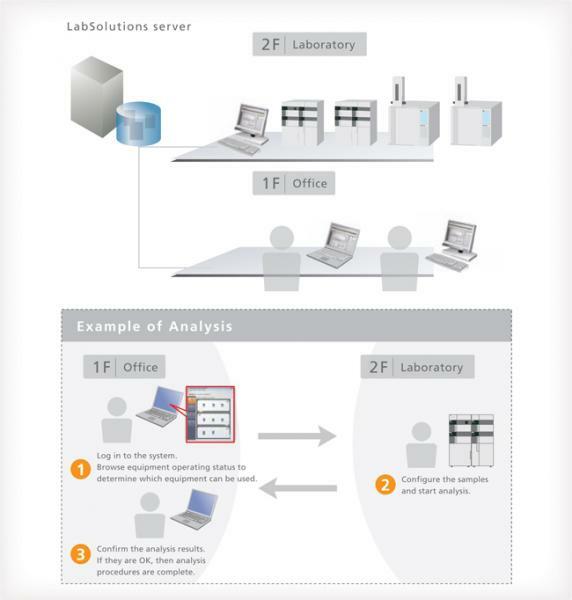 The LabSolutions operating monitor enables confirming the operating status of connected instruments, and the estimated analysis completion time for each instrument. Operating status can be assessed at a glance even when multiple LC/GC instruments are operating at the same time. This is helpful for scheduling analysis procedures to match equipment availability. In addition, equipment icons are displayed to match the grouping or location of instruments in a laboratory. With LabSolutions CS, equipment can be accessed freely, from any location, while maintaining security. For example, before starting an analysis, the equipment can be operated from a PC in the laboratory. After analysis starts, a PC in the office can be used to confirm operating status, control the equipment, and analyze the data. This improves the efficiency of analysis status monitoring, equipment control, report creation and other procedures.